Canadian-Trinidadian artist Curtis Talwst Santiago first received acclaim for his Infinity Series — miniature dioramas featuring scenes of overlooked narratives and violence on black bodies, all staged within hand-held jewelry boxes. This recent body of work focuses on the exoticized Black Knight character found in Renaissance paintings. Santiago reimagines him as a contemporary figure within abstract paintings and through colorful beaded armor. 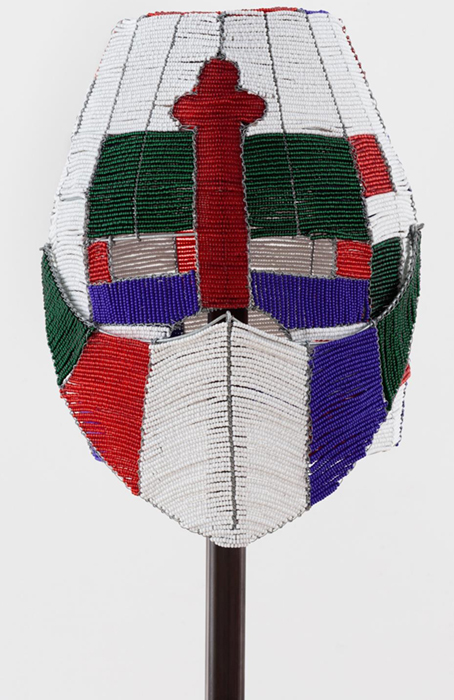 African Knight Helmet 3 bridges two visual cultures in its materials, craftwork, and structure, presenting an empowered African presence imagined within a European framework. Santiago has exhibited at venues worldwide, including the Studio Museum in Harlem, the Art Gallery of Ontario, ICA at Virginia Commonwealth University, and the Dakar Biennale, Senegal. He currently lives in Lisbon.